Wondering where to find a fancy lunch spot in Kuala Lumpur? Something made in French style with fresh ingredients? Enfin by James Won releases a new lunch menu entitled New Concept Lunch and will be available from 1 August 2017. 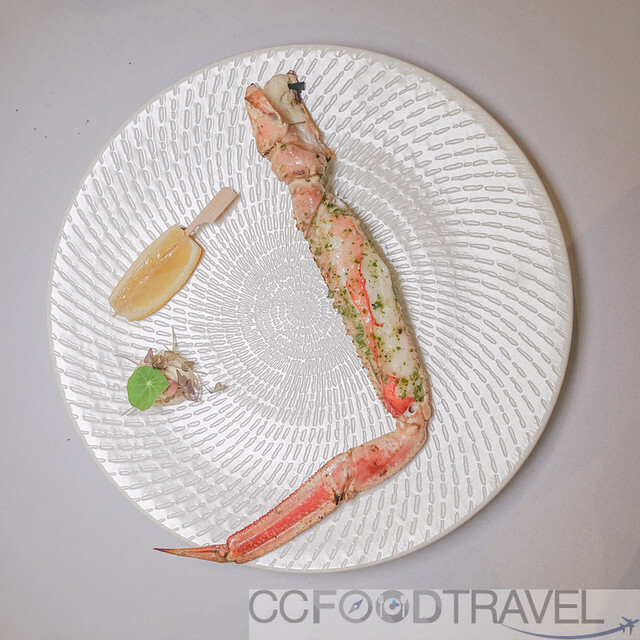 We were invited to taste some of the dishes from the new menu which provides a more affordable dining opportunity at the much celebrated french dining destination which has played host to many Hennessy and Krug events. On this occasion, the ever gregarious Chef Won himself hosted us, sharing insights into how and sometimes why the dishes were created. Are local produce goods enough for fine dining restaurants? Chef Won agrees wholeheartedly. Not only do the ingredients come at a lower cost, it is also farm fresh. 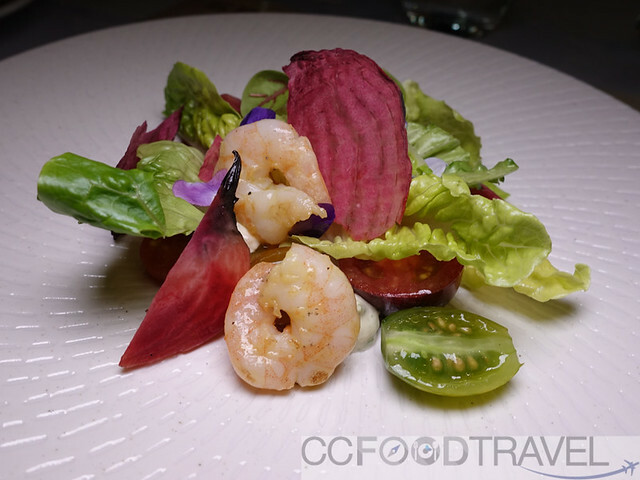 So, we kicked off our tasting session with this garden salad of locally sourced vegetables, herbs and prawns. The stand out was the raw pickled beetroot and beetroot chip which surprisingly exuded little earthy taste. Crunchy and tasty vegetables interplay with springy plump prawns. Light and wholesome. Enfin ferments their own rice wine using a variety of locally sourced rice including the prized, Bario rice, to get koji, a fermenting culture. 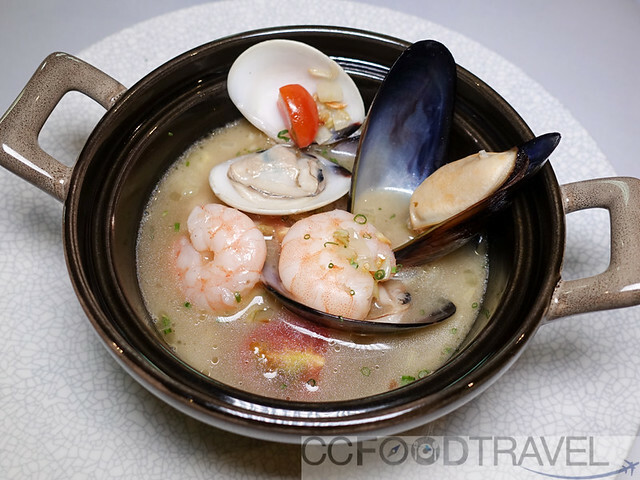 Again following the same principles of using local produce, we are treated to a seafood bouillabaisse with translucent broth with the aroma of the ocean and familiar notes of rice wine. A well-balanced, light broth with that unique umami flavor derived from rice wine and koji. Craving a good fish and chips? This serving of white fish was juicy fresh, coated with just enough batter and gently fried for that crispy crunchy. The side of seasoned fried chips came cut with skin intact, hand-cut as expected from a fine establishment. Fish and chips isn’t complete without sauces and vinegar. Our dish came accompanied with Enfin’s own special tartar and another tartar spiced with wasabi. King crab for lunch? Why not. Especially when its flesh is plump, crustacean sweet and juicy. Chargrilled, in my opinion, is probably the only way to cook a fresh king crab leg. Seasoned lightly with herbs, salt and butter, this dish was divine. Now, if only we were served a whole crab! 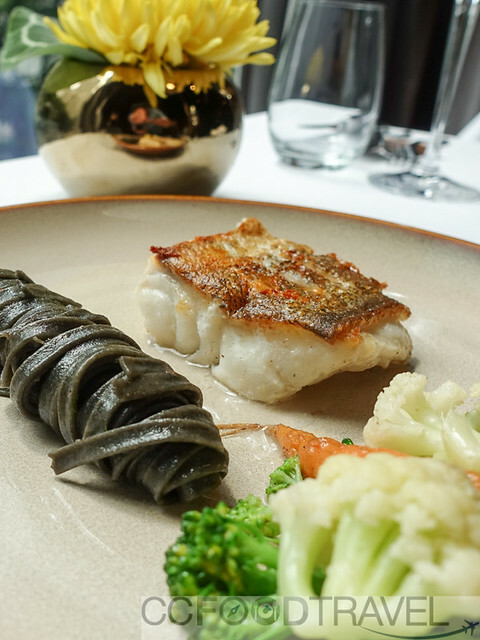 Mild oceanic flavor, flaky textured flesh and a crispy skin, that is how Enfin served us our North Sea white cod. If cod’s is not your fancy (but why? ), you may ask for other available fishes and other ways of cooking it. The french apple tart according to Won must be baked with green apples because it is less sweet. Enfin’s upside down pastry is dense in texture with mild apple flavors and buttery. The pastry could have been crispier but this is a matter of preference. 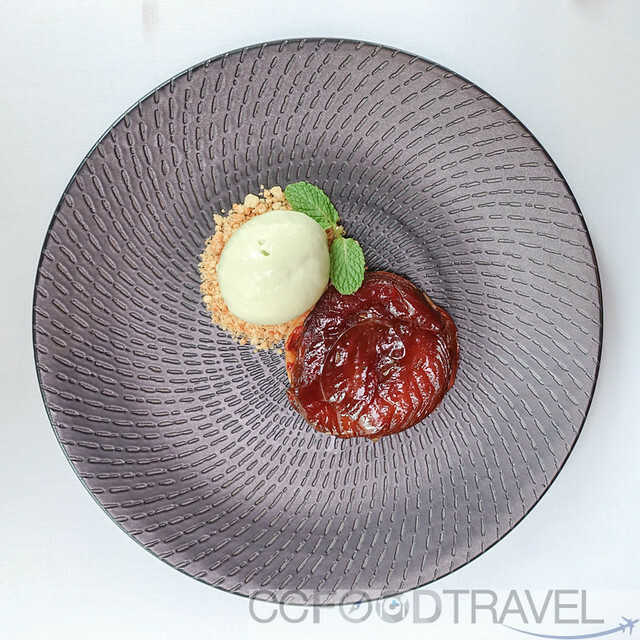 Whether you agree or not to the use of green apples, you might want to try the pandan or screwpine leaves coconut milk gelato which is made in-house. The gelato texture was very dense and sticky – a little too rich for us but you might enjoy it. The new lunch menu, beginning 1 August 2017, offers guests an a la carte menu with four entrées, 14 plates principaux (main dishes), and four desserts. The mains include fresh fish like New Zealand Tarakihi and Norwegian salmon, seafood including whole tail lobster, king crab, and yabbies. 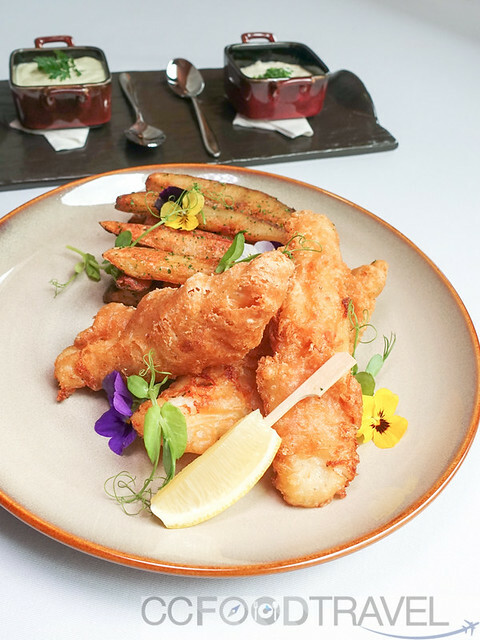 Each of the eight fresh fish and seafood mains may be pan seared, poached or steamed, fried in batter, or chargrilled, and each can be accompanied by one of four fresh sauces done the French way. Add RM89 per person for wine pairing. There is Three course Degustation (RM128). Lobster, however, is not part of the selection. Be warned though, Enfin’s addictive Artisan Bread (made with their own levain) plate with butter and three salts is chargeable RM12 per diner. Nice food photo and looks like a good restaurant!